SINGAPORE — Dec. 14, 2018 — AMD (NASDAQ: AMD) today announced AMD Radeon™ Software Adrenalin 2019 Edition, the next generation of its software suite for AMD Radeon™ GPUs, providing gamers, creators and enthusiasts with new immersive features that deliver unparalleled visual experiences. AMD Radeon™ Software Adrenalin 2019 Edition unleashes the power of AMD Radeon GPUs, delivering up to 15 percent average higher performance for some of today’s top game titles3 compared to last year. The 2019 Edition also enables streaming of PC-based games and video to mobile devices and is the first AMD solution designed to enable PC-quality streaming to standalone Virtual Reality (VR) headsets, delivering incredible VR experiences on millions of standalone VR devices2. PC-to-VR and mobile device streaming: AMD Radeon™ ReLive, combined with the updated AMD Link mobile application and dedicated VR store applications, now enables streaming of PCbased games and video to standalone VR headsets as well as a wide selection of Android and iOS-based mobile phones and tablets via a home Wi-Fi network2. The new functionality provides low-latency, PC-quality experiences on mobile devices and standalone VR headsets, delivering brilliant colors and razor-sharp images. In-game instant replay: AMD Radeon™ ReLive software, which enables gamers to capture, stream and share their greatest moments, now allows them to revel in their victories instantly by viewing a five-to-30 second picture-in-picture style gameplay clip or by creating a five-to-30 second GIF without leaving the game. In addition, the new scene editor provides more content creation tools, enabling the editing of streams and captures as well as incorporating more content into streaming overlays. Radeon™ Game Advisor: A new intuitive, wizard-like tool walks gamers through the process of tuning their games for the optimal mix of fluid animation and visual fidelity. Radeon™ Settings Advisor: Automatically recommends system and display settings for the optimal gaming experience that can be deployed with a single click. Updated AMD Link application: The free AMD Link mobile application features a streamlined user interface, new driver upgrade features, enhanced Radeon™ ReLive gallery support and, for the first time, the ability to use natural language voice commands to control Radeon™ ReLive functionality and track performance metrics. Improved performance and power management: AMD Radeon™ WattMan Technology now provides one-click controls for auto-GPU and memory overclocking5 and auto-GPU undervolting6. The revamped AMD Radeon™ Chill power-saving tool delivers up to 20 percent more power savings in select titles7. Fluid, responsive and stunning imagery: Enhanced AMD Radeon FreeSync™ 2 HDR technology8 provides auto-tone mapping to deliver exceptional color contrast and visible detail consistently across FreeSync™ technology-supported displays9. In addition, the AMD Virtual Super Resolution feature now supports ultra-wide 21:9 displays. Monitor, record and fine tune without leaving the game: The updated Radeon™ Overlay feature allows users to access system performance metrics on screen, and now includes in-game controls for AMD Radeon™ WattMan5 technology, Enhanced Sync technology and Game Advisor. The new release also provides one-click access to the AMD Radeon™ Software ecosystem, including Radeon™ ReLive, performance monitoring, Radeon™ Chill, Frame Rate Target Control (FRTC), Radeon FreeSync™ technology8, and color settings. 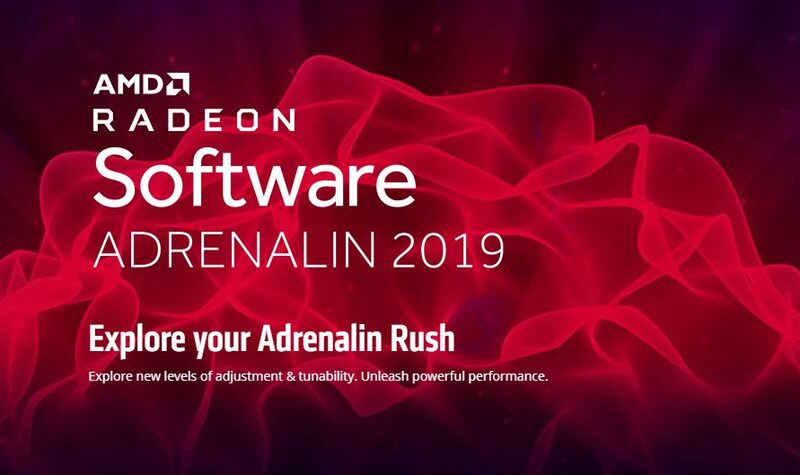 AMD Radeon™ Software Adrenalin 2019 Edition is available today here. ©2018 Advanced Micro Devices, Inc. All rights reserved. AMD, the AMD Arrow logo, Radeon, and combinations thereof are trademarks of Advanced Micro Devices, Inc. Android is a trademark of Google LLC. iOS is a trademark or registered trademark of Cisco in the U.S. and other countries and is used under license. Other product names used in this publication are for identification purposes only and may be trademarks of their respective companies. AMD’s Graphics Driver received a 93% reliability score in 2018 testing up to 11% higher than the competition. In May 2018, AMD commissioned QA Consultants to independently evaluate the stability of several of the latest graphics drivers from both AMD and NVIDIA. “Graphics Driver Quality – Determination of Stability from Leading Market Vendors”- https://www.amd.com/system/files/documents/graphics–driver–pdf. GD-134.